Krattenmaker O'Connor & Ingber P.C. is a young firm with decades of experience. For over 40 years, clients have depended on Charlie Krattenmaker for a broad range of advice in business law, real estate transactions, and sophisticated estate planning and probate. Mary Winstanley O'Connor, with her extensive litigation and real estate practice, has been recognized by clients and fellow lawyers for her particular excellence in divorce and landlord-tenant matters. 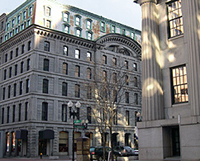 Ken Ingber's law practice involves nearly every aspect of commercial, industrial, and residential real estate in Massachusetts and around the country—acquisition, due diligence, environmental, zoning and permitting, construction, financing, leasing, litigation, and sale—as well as general business law and civil litigation. Raymond Sayeg, of counsel to the firm, has represented business and individuals in complex civil and criminal investigations and litigation before administrative agencies and state and federal courts throughout the United States. We pride ourselves on delivering practical and reliable advice and representation. We also know the importance of promptly responding to phone calls and emails and billing clients fairly and reasonably. Copyright 2019, Krattenmaker O'Connor & Ingber P.C. All rights reserved. This web site is designed by the Social Law Library, Boston, Massachusetts.